Shopping in China at a Different Time! What Should Travelers to Asia Expect this Summer? The Ugly Vegetables Turns 10! Miley Cyrus - Playground Role Model? I was helping BoBo with some homework earlier this week. She had to write about her holiday traditions and share them with her class. Admittedly, we struggled with this assignment because many of our family traditions have changed since we moved, and we are working to create new ones. One thing that remains constant is our holiday ornament exchange. The girls create handmade keepsakes, and they each receive one special ornament to mark the year. They have their own small tree on which they hang these ornaments. Every year, we save these ornaments for last. When the box is finally given to them, the girls quickly spirit themselves away in their room where they will stay for hours giggling, unwrapping ornaments and hanging them on their little tree. I don't know what they talk about when they're in there, or what takes them so long to decorate such a small tree, but this time together is one that they anticipate every year. Most of their ornaments are China focused, which isn't exactly a conscious choice, but instead evolved from their annual review of the ChinaSprout catalog. 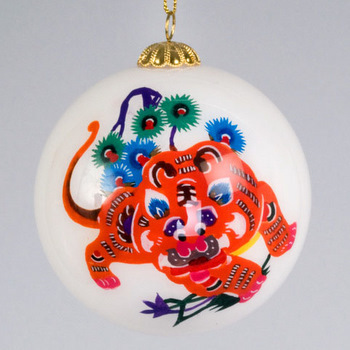 This year, WeiWei asked for the hand-painted tiger papercut ornament. Being a tiger herself, she is very excited for the coming year and is obsessed with everything tiger. BoBo is getting a cloisonne horse. It's one that she has admired for awhile, and this year, it seemed appropriate as a reminder to her to slow down and just enjoy the ride. While BoBo and I researched to see if our tradition is unique, we found other families who share this tradition as well. One of our favorite displays was Malinda's family tree at AdoptionTalk. We also ran across some beautiful Chinese ornaments at Tania McCartney's site. 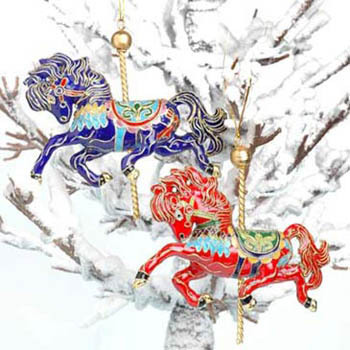 Her dazzling array of ornaments was enough to cover seven trees in their Beijing home. The girls' holiday ornaments have become a way for us to blend two cultures. While it may be only a small gesture, it is one that has a great deal of importance to them. And, because they relish their time together huddled around their tiny tree, I know that someday they will also enjoy that excitement with their own family as they open the special box and pull out the ornaments, each with a special story to share. I am currently back in China to shop for ChinaSprout again! Unlike previous trips, this time it has been more difficult to find new products. It seems that we have already carried most of the Chinese themed products that are suitable for our long standing customers. Besides a few great porcelain tea sets and bowls, and some dresses and shirts, I am not finding any new crafts, toys, stationery and other products. I asked suppliers why they aren’t developing more new products as they have before, and they told me that they have developed almost all Chinese themed products that they can, and they don’t have any more new ideas. Some overseas customers sent them some samples and it turned out that they have already done similar products, so all they could do is change the fabric patterns (which also became a problem, as there are not may new patterns developed). Secondly, the Chinese have felt the impact of the economic downturn. Many overseas customers limited their orders and there are fewer overseas tourists coming to China too, so there is no motivation to develop more new products. On the other end, suppliers feel the domestic demands have increased, and more and more Chinese are purchasing products with Chinese traditional themes. Because of this new demand, they have been developing products aimed at the domestic market. In contrast, Chinese publishers have been publishing new books on a monthly, if not a daily basis. There are different kinds of great new books that I would have never expected to be published in China before. For children's books, they have been translating popular American and European picture books as well as books about science and social studies. I used to be able to only source these type of books in Taiwan, but now they are also available in China (in simplified characters). In addition, Chinese publishers are now publishing picture books illustrated by Chinese artists, an art that was not previously familiar to Chinese artists and readers. All of these books help children not only to learn about the subjects that they study in school, but also to learn about social skills and creativity through stories and illustrations. Of course, these books are great for schools in the U.S. that have Chinese language or Chinese immersion programs. We will soon introduce these new books on our website. I will continue looking for new Chinese themed products that will be of interest on our Culture site, while adding new books for our Education site. If you have any special wishes for a product that is still not available on our site, feel free to let me know! Do you plan to travel to Asia this summer? If so, be prepared to have your temperature taken on airplanes, at customs, or in hotels. (In some hotels, you're not even welcome if you freshly landed from the U.S.) Why? Because many Asian governments have implemented strict regulations to control the spread of the swine flu (H1N1 Flu), and officials pay special attention to travelers from the U.S. When I went to Singapore in June for an annual book fair, I was surprised to see all the flight attendants wearing masks. As soon as I walked to customs, my temperature was taken. At the book fair, all visitors were asked to fill out a form with their travel routes and contact information. I said I didn’t have a phone number in Singapore because I'd just come from New York -- and suddenly there were five people asking me when I had arrived. I realized I shouldn’t have said that and just told them, “Don’t worry about where I came from.” The next day I read in the local newspaper that two passengers on a flight from New York to Singapore had swine flu (luckily, it was a different airline). Then I realized why people were so concerned when they heard I was from New York. Two weeks later, a Singapore publisher told me that they had to cancel a trip to the U.S. in November. They'd registered for a national foreign language conference a year before, but Singapore government discourages all delegations from traveling to the U.S.
Then I learned friends in the U.S. who'd traveled to Beijing and Shanghai had similar experiences. Before they got off the airplane, their temperature was taken by health officials wearing outfits like space suits. Wherever my friends went, they told people they'd been in China for more than seven days even though they'd arrived just a day or two earlier, because the Chinese government warns citizens that seven days is the critical spread period. One of my friends went to China to visit her hospitalized father, but after four days the hospital didn’t allow her back, even after her complete test for swine flu was negative. I even heard that some American high school students went to China for the summer study program and couldn’t stay in the Beijing hotel they'd originally booked because the hotel worried someone had swine flu. Some publishers in Beijing also told me that they had to cancel their trips in the U.S. because of swine flu worries. Now I am back in China, and I didn’t experience the same precautions as I did on the plane to Singapore. Very few flight attendants wore masks, and nobody came on the airplane to take temperatures. But we all had to fill out a very detailed health form. Besides questions about our health condition and contact information, we were asked where we'd been in the past seven days and where we'd be in the next seven days. There are automatic temperature gauges set up on the route to customs, so everyone had their temperature taken as they walked through. As soon as I was back home, everyone asked me how serious the swine flu was in New York and if I knew anyone who got it. Then I saw signs in public places and restaurants about how to prevent swine flu. Why are China and other Asian countries so sensitive about swine flu, and why do they believe so many people in the U.S. have it? What role have media played in this anti-swine flu campaign? This reminds me how U.S. media reported on the Sichuan earthquake last year; the stories we heard in the U.S. were so different from the ones told in China. And now Chinese people are experiencing the same. They believe what the media tells them about swine flu in the U.S. and worry that travelers from the U.S. will bring it to their country! Nevertheless, don’t be discouraged by my experiences. All I want to say is don’t be surprised when your temperature is taken or you're asked to fill out that long form about your personal health condition and travel plans! Enjoy your trip to Asia! About two weeks ago, I attended a conference "Putting the World into World-Glass Education", hosted by the Asia Society. The conference aimed to "bring together K-12 educators, policymakers and resource providers to focus on developing American students' global competencies." During the conference, I went to different presentations and was excited to see so many schools across the country focusing on global education through language learning, culture education and study tours. One session, "Singapore Math in the U.S. Classrooms," made me think again about the differences in education between the U.S. and China. In that presentation, two presenters introduced Singapore Math methods, as well as the education system in Singapore. They talked about how government supports teachers and students, and how students learn math and other subjects. Everyone in the room wished for a similar system in the U.S.
Singapore Math focuses on teaching math basics step by step and having students practice these basics on a daily basis -- in many ways very similar to what we did and are still doing in China. While the participants were puzzled with the math problems for 6th graders, I was wondering if the Singapore Math or education system is really the direction the U.S. math teaching and education should go. Yes, maybe Singapore's and China's education systems are great for teaching math, but how about creativity, innovation, and social skills? If a country lacks these skills but has plenty of math skills, will it lead to global competency? On another side, I really feel math education in the U.S. is behind international standards. My son has not learned much math in his elementary school, at least not like we did in school, with endless math drilling in the classroom and at home. Having seen his math book and homework, I understand why Americans cannot do math. But do we really use math on a daily basis at work? I only realized that when I started ChinaSprout-- it's not because we need math to calculate sales, but we use math to guide logical thinking to improve the business. Luckily, my son has been practicing math at Kumon since he was six years old and has started learning Singapore math in his middle school. Nevertheless, I do think creativity, innovation and social skills are more important than math skills and unfortunately, China and Singapore are lacking such education or promotion. If U.S. education is behind international standards, how could the U.S. have the innovative technology and creative people that made it a world leader of technology and creative arts? Interestingly, the plenary guest speaker in the following day's session answered some of my questions. Professor Zhao Yong from Michigan State University shared his studies about "Catching Up or Keeping the Lead: American Education in the Age of Globalization" with the audience. He showed us statistics that American math skills in secondary schools were among the second to last position in international standards 4o years ago, but the U.S. now has one of the highest living standards among countries. Why is that? He talked about 3 Ts: Technology, Talent, and Tolerance. He said the U.S. has the most advanced technology and focus on developing technology, and the U.S. education system discovers and encourages talents and tolerates differences among students, regardless their of backgrounds or whether they think differently. He also gave us the example of the talent shows that his daughter's elementary school has. In these talent shows, there are no standards, no rankings, no prices; students can just show whatever talents they have. Professor Zhao Yong also showed us some photos of Chinese moms holding the certificates of their children passing the Olympic math contests, comparing the photos of U.S. moms doing crafts projects with their kids. Yes, that's the answer, the schools in the U.S. may not focus on math drillings, but they encourage talents and tolerate diffferences. These are the things that we have never experienced in China, no standards, no rankings in a show or competition? How could that be possible in China? As a result, students in China focus more on standards and rankings not only in such talent shows, but also in their daily school work. And when we focus on such standards and rankings, how can students be creative and innovative and tolerate differences? For awhile, I have been wondering why the U.S. education seems behind global standards, yet the U.S. has most creative and innovative people in the world. Now I think I understand much better why this is. Shall the U.S. "catch up" to the global education standards or "keep up the lead" of technology, talents, and tolerance in the world? Or should the U.S. do both, but is it possible to do both? These are the questions I still have, and hopefully you will have some answers. Six weeks ago, my friend Jill and I started a Facebook group to "boycott" the Warner Bros. film "Orphan". The group, which was started as a test of the power of Facebook, has reached an audience larger than either one of us expected. The members of this group now number almost 4,200. The purpose to starting this group was specifically to get an offensive quote ("It must be hard to love an adopted child as much as your own") removed from the trailer. We also wished to encourage Warner Bros. to market this horror film appropriately -- i.e. avoiding exposing kids. Within a week of starting the group, Warner Bros.' Sr. Vice President of Corporate Communication, Scott Rowe, contacted us and advised us that the offending quote would be removed from the trailer. To his credit, he was apologetic and completely understood the position of the adoption community. Unfortunately, the trailer continues to air at times when children are exposed, and the poster is popping up everywhere causing some children distress. Not everyone is so understanding of exactly why this movie premise is offensive to some. Comments run the gamut -- "It's just a movie," "Your priorities are in the wrong place," "You need to teach your kids to be tougher," and the ever-present "I'm sick of everything having to be politically correct." It's this last comment that continually gives me pause. Being politically correct in this instance specifically means avoiding causing harm to some of the most vulnerable of children -- those who have lost their birth parents and who are working to find a place where they feel they belong. Getting down to the nitty gritty of that ridiculous statement, these people are saying that it's OK to cause children grief because, hey, it's all in sport. With adults putting their own desire to spend $8 to be scared of things that go bump for two hours above the emotional well-being of children, it's no wonder the world is in the state it's in today. I'm left to wonder, what exactly is wrong with political correctness? It involves awareness of self and others, thinking before you speak, kindness, compassion, and the all-important treating others as you wish to be treated. Are these not the same moral tenants that children have been taught for centuries? What a sad state we are in when the dollar value of compassion is less than the cost of a matinee. Just released Wednesday, Grace Lin’s new book, Where the Mountain Meets the Moon, has already received starred reviews, a 2009 Parent’s Choice Gold Award, and a place in the Top 10 SF/Fantasy for Youth. She takes some time from her busy week to tell us what the buzz is about. CS: This fantasy novel is so very different from your other books. What were your goals when you set out to write it? Grace: Well, I've always loved fairy tales. They were my favorite books to read when I was young. I think my goal when I write any book is to write the book I would've loved as a child. So, Where the Mountain Meets the Moon, while different in genre has the similar goal as the other books that I've written. CS: How did you choose the name Minli for your main character? Does it have special meaning? Grace: Minli, in Chinese, means "quick and clever" which were the traits that I wanted my main character to have. Many Chinese name meanings for girls tend to focus on traits of beauty and modesty. But, I wanted my character's main distinguishing features to be her inner strength, full of spirit and independence—not the loveliness of her appearance; and I wanted her name to embody that. So, when I found Minli (it is the Chinese phonetic match to the name Emily), it was perfect. CS: Do you see some of yourself or childhood friends in Minli? Grace: I think the way that Minli and I are similar is our earnestness. I tried to write her as I would feel, with as much sincerity as possible. I didn’t want to make her an annoying “goody-two-shoes,” but I did want to convey that feeling that all of us have of just trying to our best, of always trying to do the right thing. This is probably even more poignant because this is the novel that I decided I would try to make the best work I’ve ever done. It was my New Year’s resolution! So, I pulled out all the stops for this book, from the writing to the cover to begging for color printing. Like Minli, I am just trying to do my best! CS: Certain parts of the story just beg to be read aloud, and I look forward to reading the book to my daughters. (I can’t wait to roar when Dragon finds his courage!) Was it intended as a real-aloud? Grace: I began my children’s book career with picture books, so striving for the read-aloud quality has been something that has been ingrained in me. As I write, I almost always read it out loud to make sure it is clear orally and make changes accordingly. But I think Where the Mountain Meets the Moon can be enjoyed either way, read aloud or alone. I wanted the book to be appropriate for young children who are able to read at a higher level but may not be ready for the subject matter of older books; and I also wanted the book to be enjoyable for adults and older children. I wanted it to be a book that the whole family could share; where no one would be embarrassed or confused, but everyone would still take great pleasure in. So, Where the Mountain Meets the Moon is a book with meanings that can be understood at many different levels as well as a fun adventure story. Or, at least that is what I meant it to be! CS: In our last interview, you said elements of your trip to China were woven into this novel. Can you elaborate? Grace: Well, when I first began writing this book, I had visited Hong Kong and Taiwan which were wonderful trips. Being Asian-American (and more American than Asian), it was a fascinating experience to be surrounded by a culture that was so foreign and familiar at the same time. Whenever I viewed the landscape, saw a temple or a sampan in the water, I suddenly would remember the Chinese folktales I had read as a child. I could see them happening in the setting around me and I knew in there was a book waiting to be written. 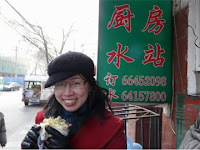 I was almost 3/4th finished with writing the book when I went to visit China. This was the perfect time to go, as I had an idea of what kinds of things I wanted to see and research there but the book was still open enough to be changed. And it was wonderful! Actually seeing China with my own eyes and experiencing it added such a rich layer to the story. For example, one of the excursions we took especially for the book was a visit to a tiny mountain village. I wanted to see a mountain village because I knew Minli (the main character in Where the Mountain Meets the Moon) would be visiting one. The whole time we were there, we were freezing cold but the villagers were so friendly and red-cheeked (which I was to find out later was wind-burn, not good circulation). So, those elements of mountain cold and a warm, friendly shelter became the backdrop of the village Minli visits. CS: Folk tales are a big part of Minli’s life, thanks to her dad. Are those stories based on actual folk tales? What role have folk tales played in your own life? Grace: The book was inspired by the Chinese folktales and myths that I read as a child. Where the Mountain Meets the Moon is very, very loosely based on the Chinese folktale "Olive Lake." Aside from adding many layers and changing plot points, I also changed the main character from an adult male to the girl Minli. Many of the stories-inside-the-stories are inspired by Asian folk stories as well. 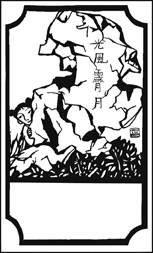 For example, "The Old Man of the Moon" and "The Buffalo Boy and the Weaving Goddess" are very famous Chinese legends/tales—the Old Man of the Moon is the Chinese God of Marriage who ties future spouses together with a red thread and the Buffalo Boy and Weaving Goddess are the lovers whom Chinese Valentine’s Day is inspired by. I’ve embellished both legends for the novel, but I did try to keep true to the original sentiment of them. For me, folk tales were one of the thin threads that connected to me to my heritage when I was younger. In my youth, I disregarded my Asian roots in a quest to be "really American." But, as I said earlier, I loved folk tales and fairy tales and reading the ones from Chinese culture lay the subtle seeds for interest in my heritage to sprout later. CS: Where the Mountain Meets the Moon has been likened to the Wizard of Oz stories. Were those favorite books when you were a child? What other stories had a strong influence? Grace: The Oz books were some of my favorite books—I read the entire series and was so upset when there were not more. But I didn't realize until after I had written Where the Mountain Meets the Moon how similar it was, though I suppose it should have been fairly obvious! I suppose it was my subconscious wish to play Dorothy in my elementary school theatrical coming out. Other books that I think influenced Where the Mountain Meets the Moon are My Father's Dragon by Ruth Stiles Gannett and The Search for Delicious by Natalie Babbitt. CS: You’ve said that writing this fantasy book was a very consuming process. Tell us how it changed your routine and monopolized your thoughts. Grace: It was really important for me for all the stories to tie together, because of the red thread theme—how everything is connected. Yet, when I began the book, I knew a little less than half of how and which stories would tie together. The beginning story of how Fruitless Mountain would turn green came to me pretty early on, but many of the other stories—"The Green Tiger Magistrate" and "The Paper of Happiness," actually came while I was writing the book. It was actually a very organic process, where I had the seed of what I wanted and then once the story took root, hundreds of vines grew. So, this book was a very consuming process. I was constantly thinking of how to link stories—writing notes on scrap pieces of paper at the gym, Post-it notes all over my house, notebook scrawls at lunch. This was the first book that I’ve written where it was impossible to work on anything else at the same time. I traveled to China and Taiwan and relived my trip to Hong Kong as a way for me to soak up the landscape and help create the imagery in my mind. I also read and reread many Asian folktales and myths. Many times, I would read a myth that was little more than a line and would be unable to find more—which lead me to create the story in my head. For example, at Chinese New Year, it is common to find pictures of two plump children dressed in red decorating doorways. These children are called Da-A-Fu. Why? I researched and only found a very short summary of them: They were two spirits transformed as children sent to destroy a green monster that was terrorizing a village. There were no details of how or why or what village, but it was enough to spark my imagination. So with that, I created the twin characters of A-Fu and Da-Fu, who destroy the Green Tiger in Where the Mountain Meets the Moon. Even with the research, however, this book had its challenges. I am most definitely Asian-American, and probably more American than Asian. 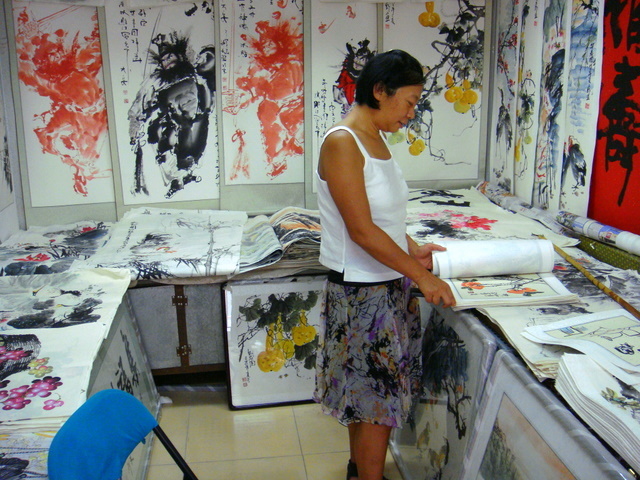 So capturing Chinese authenticity was something I struggled with as well as debated internally. The book is very much tinged with my Asian-American sensibilities. For example, I knew and learned more about foot binding for young girls in China, but I made the conscious decision to leave that tradition out of my book. I try to make a point in my author’s note that the book is an Asian-inspired fantasy, not full of historical truths or even traditional Chinese values. I hope people still enjoy it as such. CS: In my favorite paragraph, Minli decides fortune doesn’t consist of gold and jade “but something much more.” What inspired you to make fortune’s true meaning a key element in the book? Grace: Well, this story first was inspired by the folktales and fairytales of both Asian and European/American cultures that I read and loved as a child. My travels to Hong Kong, Taiwan and China brought the settings of the story to life for me, inspiring the imagery. But mostly, this book is an homage to my late husband. He had been ill with cancer for many years before he passed and his struggles taught me what is truly important in life, which is why fortune's true meaning became such a dominating theme. CS: So many writers get locked into one genre. You’ve done picture books and novels, and soon you’ll publish early readers. How do you manage to stay so fluid? Grace: I think almost every writer can write other genre. It's publishing another genre that is tricky! I've just gotten lucky that publishers have been willing to take a chance on my projects. I think I grow into each genre, which I think helps—in other words, I haven't gone from a dim sum picture book straight into an angsty teenage novel about drunk driving (NOT writing the latter, by the way). What usually happens is that all my ideas begin as picture book ideas and they grow into a novel or an early reader if they don't fit the picture book format. CS: What a treat for young readers to find so many full-color illustrations in a chapter book! Why was it important to you to do that, and how did you pull it off? Grace: I loved the illustrated MG books when I was younger and I still do. I think they add so much to experience of reading. To me, they are perfect—they give a glimpse of visualization into the world you are reading, but not so much that you aren’t left with anything to imagine. Also, they make the experience of owning and holding a book feel that much more special—turning the page and seeing a full color illustration is almost like discovering a jewel and the book itself feels like a little treasure. I really wanted Where the Mountain Meets the Moon to bring back the feeling I had when I had read those types of books. I pulled it off with a lot of begging and a wonderfully supportive editor! CS: Please explain how the swirls you use in so many illustrations took on a deeper meaning for you with this book. Grace: Somehow, without planning it, my illustration trademark has become "swirls in the sky." What began as a personal, patterned shorthand for wind and air has become a distinguishing element of my painting style. I mostly don’t mind this, I enjoy painting the swirls as well as the effect they have on the overall painting. But, a small part of me has always cringed at the possible gimmicky nature of it. However, during my research for Where the Mountain Meets the Moon, I found that a right-turning swirl had symbolic meaning in Chinese culture. The swirl (like the endless knot) could be seen as symbol for the eternal circle, the continuity of life without a beginning or end and is always interconnected. And by spiraling to the right (clockwise), the swirl echoes the movement of the sun, moon and stars against the celestial sky. Supposedly, even the hairs on the Buddha's head as well as his belly-button swirl to the right. This knowledge thrilled me. The eternal circle, the endless knot--these symbols correspond with the themes of Where the Mountain Meets the Moon. In the book, small, seemingly unrelated stories are slowly revealed to be connected—the fates of a fruitless mountain, a dragon that can’t fly, a lost paper revealing the secret to happiness, and the fortune of a young girl are all intertwined in the circle of the novel. I immediately decided that I would paint all the swirls for the book right turning, to follow the movement of the moon. So enthused was I about this, that I asked for the cover art to be returned so that I could “fix” it (for catalog purposes, the publisher had asked for the cover art to be done first—before the book was finished). I could change the art for the final cover they told me, but the old image—the one with both left- and right-handed swirls, was already being used for the advanced reading copy and publicity. Still, I felt strongly that I wanted to change it. However, after years of painting swirls haphazardly, the discipline of painting right-handed swirls turned out to be more difficult than I thought. I would get halfway through painting the background swirls when my eyes would lose focus and suddenly I couldn't remember which way was the "right" way. Many, many, many times after I thought the painting was finished, I would suddenly see a left-turning swirl and have to correct it. Right-turning swirls suddenly did become an endless circle of life for me! I think it was worth it, even though I know it'll be lucky if viewers even register the swirls much less the direction they are turning. For some reason, I believe these nuances make a difference—if only to let me feel that the purpose for the patterns I paint are a subtle visual message that I am communicating. But, if you see a left-turning swirl anywhere in the book, don't tell me. CS: Any chance Minli will show up in a sequel? Grace: I have no plans on writing a sequel to Where the Mountain Meets the Moon, but I would like to write another fantasy novel someday. Maybe Minli will have a cameo role. I just have to hope the muse strikes! CS: We hope it does, too, Grace. Thanks for your time! For readers who'd like to join the fun, check out Grace's online book launch. Save 10% on an autographed copy of Grace Lin’s new chapter book. Each copy includes a special edition bookplate designed only for ChinaSprout! ChinaSprout launched officially on June 19, 1999. The story of our origins are humble. It began as nothing more than conversations between mothers on a playground — with many mothers asking me for advice about how to teach their children about Chinese culture and me looking for a way to fill their void. A few weeks before our launch, I was told about the FCC of Greater New York’s annual “Chinese Culture Day”. I had been preparing to launch the ChinaSprout website and thought that this event would be a good opportunity to to promote the company. We rushed to prepare the website to go live and then, armed with fliers, books, crafts, and Chinese dresses for girls, I headed to Chinese Culture Day on June 19. I will never forget that beautiful, sunny day in Terrytown, New York. Although I had prepared for the event, I was completely surprised at the outcome. There were so many families with Chinese girls. Even though I had met some adoptive families in my neighborhood, I had not expected to see so many adoptive families at this event. There were quite a few Chinese product vendors, as well. However, ChinaSprout was the only vendor with a diverse display of books, dresses, and crafts. People were very excited to see these products and were even happier to find that we offered a greater selection on-line. Some of these families helped to spread the word about ChinaSprout by posting messages about us on Internet list serves. Their generous word-of-mouth helped to launch ChinaSprout and to this day, word-of-mouth contributes greatly to our growth. A few days after June 19, 1999, ChinaSprout began accepting on-line orders. Ten years have passed and I could not have imagined on that evening, when I packed up from Chinese Culture Days, that ChinaSprout would be where it is today. We have grown from attending our first small, local event to achieving international sales. We are now selling products not only to families with children from China, but also to anyone who with an interest in Chinese culture. We have grown to serve schools across the United States that teach Chinese as a foreign language. Although I had been promoting Chinese language products to public schools since early 2000, I never expected that Chinese would become such a popular subject. It is now the second post popular foreign language among public and private K-12 schools. As ChinaSprout has grown, we have continued to expand our customer reach from selling products on-line to incorporating traditional channels with our print catalogs and promotions and appearing at nationwide events and conferences all year round. Our products are not only imported from China, as I did in the first two years, but we now carry products from Taiwan, Hong Kong, Singapore, and the U.S. More importantly, we also produce and manufacture our own products. Today, I can proudly say that ChinaSprout provides the largest and best collection of Chinese culture and educational products on the Internet. Of course, this would not have been possible without your involvement and continuous support. I want to take this opportunity to thank you all for all your feedback, suggestions, and business. To celebrate our 10th anniversary, we will be offering many exciting programs and promotions over the coming year. It is our way of saying “thank you” and celebrating what we have done together. We can’t wait to see what the next 10 years bring! The book’s tattered pages are a testament to the joy Grace brings to children, enchanted by the bold colors and brave characters who show what can be accomplished when determined sisters stick together. 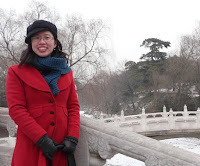 Today, as ChinaSprout kicks off a series of interviews with notable authors and illustrators, Grace talks about her Asian American childhood in upstate New York, her journey into new genres, and an eye-opening trip to China. Check back in June, when Grace will return to this page to discuss her soon-to-be released novel Where the Mountain Meets the Moon. CS: Like a lot of writers, you loved to read as a child. How did the books you read back then influence the ones you write now? Grace: Well, a lot of the books that I create now are almost homage to the books that I loved as a child. As I said in my author’s note in The Year of the Dog, some of my favorite books were the B is for Betsy or Betsy-Tacy books; I modeled The Year of the Dog and The Year of the Rat on the same themes—everyday friendship and family. Mine just happens to be an Asian-American family. When I was younger, there were not a lot of books with Asian characters, much less Asian-American characters. The books that were available were like The Five Chinese Brothers which, as a thoroughly Americanized girl (surrounded by McDonald’s hamburgers and Little House on the Prairie TV shows) I could not relate to. Throughout my childhood, I yearned for books that had someone like me in it—characters that I could relate to. Now, when I create books I remember that and try to make books that I would’ve loved as a child. CS: Fans with growing girls are thrilled that you’ve begun writing novels for kids. Now they can enjoy your work after they’re past the picture-book phase. What prompted you to make the leap? Grace: The Year of the Dog began as a sequel to my book The Ugly Vegetables. However, as I began to write, the book would just not fit in a picture-book format. There were so many memories—funny stories that needed to be told, poignant stories that couldn't be left out, family stories that insisted on being written ... they just couldn't be contained in 32 pages. Finally, I realized that it wanted to be a novel and let it become The Year of the Dog. It took me only 5 years to come to this conclusion. But once I let it happen, things moved fairly quickly and I realized I loved writing novels. I love how much more of the story I can tell and the writing freedom. In some ways writing picture books is harder than writing novels; one has to be much more disciplined when writing a picture book text. CS: When reading your novels Year of the Dog and Year of the Rat, it’s fun to know they’re based on people and events from your childhood. How did you go about rekindling all those memories? Grace: Well, I collect memories slowly in my notebook(s). So, I always have a notebook (or these days the iphone!) with me. Whenever something reminds me of a past experience or my parents talk about their memories, I usually notate it and when it is time to write I look at my notes. They usually spark a story which sparks more stories and then (hopefully) they all come together into a novel. CS: And now you’re getting mail from young readers themselves and not only parents of preschoolers! What do they say? Grace: I love getting mail! Usually young readers tell me how much they enjoy my books (which is wonderful) and ask me when I am going to write another. Once in a while I will get suggestions on what to write for my next book; I have received a couple of requests for books about ponies! CS: My daughters always recognize art by certain illustrators, such as Jan Brett, Eric Carle, and you. What inspired the trademark swirls and black outlines in your artwork? Grace: The swirls are kind of my pattern for wind or air. I was inspired by Van Gogh's painting "Starry Night," and also because the swirl can be seen as a symbol for the "endless circle" (similar to the endless knot) in Chinese culture. I think the bright colors of my work were inspired by all the bright flowers my mother grew in the garden and the black outlines by stained glass windows, another art form I loved to look at as a child. CS: When you traveled to China with your sister last year, what surprised you about the country? How have you used elements of that visit in your work? Grace: China was so much more vibrant and richer than I imagined. But there were more small differences than I anticipated. 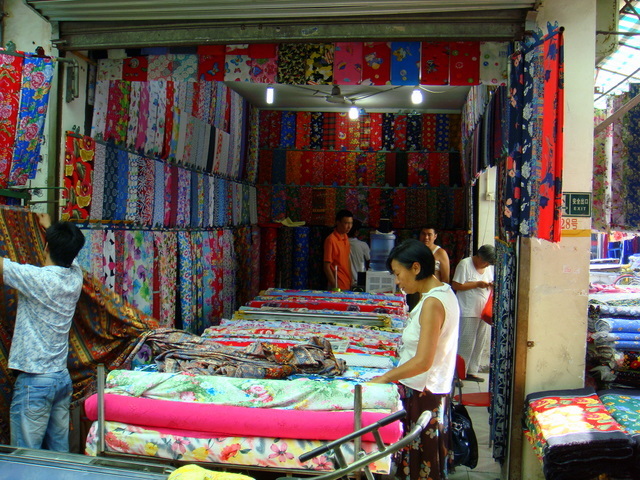 For example, purchasing things in China is a multi-step process; bargaining is always expected. In China, I remember a group of waiters being fascinated by my sister and me—first, that we were sisters (a rarity in one-child policy China), and that we could barely communicate in Chinese. Those unexpected little things made me realize how important it is to experience other cultures in person. I definitely used my experiences in China in my new novel Where the Mountain Meets the Moon, and Beijing is going to be the setting of an upcoming picture book. CS: What inspired your picture book The Red Thread: An Adoption Fairy Tale? Grace: The Red Thread is actually a very controversial book for me. I have not internationally adopted (though it was something my late husband and I thought about) so it is a book about issues that I may have not grasped thoroughly and can be misunderstood. I have been honored in the past to be invited to many Families with Children from China events, and noticed that many Chinese adoption groups had taken the legend of the red thread (a belief that people destined to be together are joined by an invisible red thread) which was originally for marriages and reinterpreted it for adoption. I thought that was fascinating and wonderful, how myths are and can be transformed over time. To me, it is like being Asian-American—the changing and melding of customs and cultures to fit real life. I feel like it makes these beliefs more real, more “living”—not just studied in a book. So I took that interpretation of the red thread and made a fairy tale story out of it. However, there has been some concern that The Red Thread "glosses" over the truths of adoptions, painting an unrealistic picture of families torn apart and brought together as well as racist undertones (yikes! )—I hope anyone who knows me or my work would know that was not my intention. For those who find offense with the book, all I can say is “I’m sorry!” and thank those who enjoy the book in the spirit it was intended. CS: Does it bother you to be labeled a “multicultural” children’s book writer and illustrator? Grace: When I first started out, it did bother me but now I don’t really care. Being “multicultural” is tricky in terms of marketing and career projectory; but nowadays I just concentrate on books that I love making and that I want to share with people. It’s not that I’ll never do a book with a Caucasian boy (I would do a book on anything if I felt it was right) or that my books are meant to preach (horrors!). It’s just that a while ago, I realized that being able to publish my work was a gift not to be squandered on something soulless. And my soul is Asian-American. CS: You’re obviously a prolific writer and illustrator, but do you ever get writer’s block? Or start a book and scrap it? You must have a proven method for getting past that. Grace: I don’t really “scrap” an idea, but I do let things sit on the back burner if they don’t seem to work. As I said before, the stories for The Year of the Dog sat around for five years until I realized how to make it work. To get past writer’s block, I usually just start working on something that has a deadline. Somehow, whenever I am working on a deadline project, I suddenly get lots of ideas for other projects. Works every time. CS: Talk about about your most rewarding moment as a writer/illustrator. Grace: There have been so many rewarding experiences that I am very grateful for like fan mail, the Lissy doll, theatrical interpretations—it’s hard to pick one. Most recently, someone said to me, “Oh, my kids grew up with your books,” and I had to pinch myself. How neat is that? Just realizing that my work has become a part of someone’s childhood is extremely rewarding. CS: Sounds like you’re on the road a lot with speaking engagements, but please describe a typical day when you’re home. Grace: Oh dear, I'm really very boring. I wake up, eat, check my email and surf the net under the guise of "industry research," which usually meanders its way to "book idea research." Then, when I am horrified at the amount of time I have spent sitting on my bum "researching" (probably while eating at the same time), I go outside and ride my bike or go to the gym for an hour or two. Then I return home and write, draw or paint—trying all the while not to get sucked back into "researching." Of course I inevitably do, and the rest of the day is filled with the back and forth battles of concrete work vs. pretend work. This usually goes on until I go to sleep at night, unless I am seeing friends for dinner or someone comes over. Depending on deadlines and/or the next day's schedule, I go to bed at around 11 p.m. - 2 a.m. Of course everyday errands such as cleaning, groceries, etc., get jumbled in, but all in all, I have a pretty quiet life. I hope that wasn't too disillusioning! CS: What do you read in your free time? Which titles or authors have especially impressed you lately? Grace: I have not had the time to read a lot lately, but the most recent book that I’ve enjoyed is Masterpiece by Elise Broach. Another book is Alvin Ho by Lenore Look, whose writing I admire quite a bit—it is very clean, simple, poetic and fun. CS: Am I wrong or do you have a slight obsession with food? It’s not just Fortune Cookie Fortunes, The Ugly Vegetables and Dim Sum for Everyone! Even in your novels, food is a frequent topic. What’s that about? Grace: Well, I learned in Taiwan that the Chinese character for "beauty" is actually made up of the characters for "big" and "sheep." A big sheep obviously meant a delicious meal; the character implies a beautiful taste. So, early Chinese equated good food with beauty, which is something I do as well! Though, I would prefer not to think of myself as a fat sheep. CS: Your first picture book, The Ugly Vegetables, was published 10 years ago. How has your life changed during that time? Grace: Well, it has changed quite a lot. I’ve been a bride, a wife and a widow, as well as an illustrator, an author-illustrator, and author. These are threads that make up my life, and I try to be grateful for the bitter as well as the sweet. 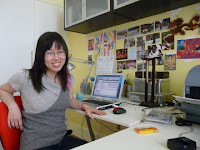 Grace: Hmm, let’s see: Grace Lin is the successful author and illustrator of beloved books by children young and old (including her recent bestseller) and lives with her loving and healthy family in a charming home in a lovely town/city filled with good friends. CS: Next month we’ll talk about your new novel, Where the Mountain Meets the Moon, set for release in June. But for now, what other titles or projects can we anticipate? Grace: Right now, other than preparing for the launch of Where the Mountain Meets the Moon, I have been working on Ling and Ting, which will be an early reader featuring Asian American twins. I'm so happy to be working in the genre; my favorite books when I was young were books like Frog and Toad, Snipp, Snapp and Snurr, and Flicka, Ricka, and Dicka; to do this book is really a great gift to my childhood self. Since the writing in this book will be spare and stylized, the illustrations are also going to be more stylized and simpler than my picture books. Also down the pipelines is a picture book on the Moon Festival (featuring the same family in Dim Sum For Everyone!) and another picture book called Li Na’s Lily which will be set in Beijing. I have a couple of novel ideas in my head, but none under contract yet—so I’ll wait before I talk about those! Another project I would like to mention is my small graces charity project (http://www.smallgraces.org/). Once a month a small (roughly 5x5 inch), unpublished, original painting of mine will be auctioned off through eBay with 100 percent of the proceeds to benefit the Foundation of Children's Books. The original paintings, done by me, will all be illustrated small bits of wisdom (inspired by the collecting I've been doing on my personal blog for Fortune Cookie Fridays). There will be a new painting a month for the year of 2009. This is a great way to own a piece of my original art for a bargain price! CS: Sounds great. Thanks for your time, Grace, and we’ll talk again next month! One of the hobbies that our family enjoys is cooking. It's a good way to work on math concepts, spend quality time together, and enjoy the fruits of our labor. The girls love to try new Chinese recipes, so every few weeks, we pull out one of our Chinese cookbooks and explore. Whole steamed fish is one of our favorite recipes. It's easy and tasty, and we know it so well that we don't require a cookbook anymore. Whole steamed fish is most often associated with Chinese New Year as the Chinese word for fish (Yu-鱼) sounds like the Chinese word meaning abundance. Thus, serving whole steamed fish symbolizes wishes for abundance in the new year. Although access to the local Chinatown is typically limited to major metropolitan cities, there are many cities that now have Asian markets where you can find live fish. It is best to use the freshest fish possible. However, if live fish is either not available or personally palatable, you can use fish from the fish market or grocer's fish section. Again, the preference is for whole fish over fillets and fresh versus frozen. The Chinese typically serve steamed fish whole, which means face and all. Some people (including my father) find "food with a face" unappealing. If you're one of these people, you can cut off the head during preparation or ask your butcher to do it for you at the store. Most often, when we ordered whole steamed fish in Chinese restaurants in Los Angeles, we were served rock cod or bass. We prefer to avoid Atlantic cod and Chilean sea bass for environmental reasons, and in cooking this meal for ourselves, we have enjoyed other fish including tilapia, Pacific halibut, farmed striped bass, and yellowtail snapper. Alternatively if you do not have a fish steamer, you can use a large wok or deep pan and set an inverted baking dish or heat proof plate inside (see photo for example). If your whole fish will not fit inside, you can cut the fish in half. Cut up the scallions, ginger root, and lemongrass. Slice open the fish at the belly (if purchased live and butcher did not do this). Clean and dry the fish. Make 3 diagonal slashes on both sides of the fish. Mix together 1 teaspoon sea salt with all of the white cut scallions, half of the ginger root and lemongrass, and 2 tablespoons of the peanut or corn oil. Stuff the cavity of the fish with half of the seasoning mixture, and place the seasoned fish in the refrigerator for 30 to 60 minutes. Place the other half of the seasoning mixture on the steamer tray or heatproof dish. Place fish into the steamer on the bed of the seasoning mixture. Steam over medium heat for 10 to 15 minutes, until the fish is thoroughly cooked and flakes easily with a fork. Remove the fish from the steamer. Discard the cooked seasonings and move fish to serving plate. Warm soy sauce, sugar, sesame oil, and 1/2 teaspoon sea salt in a saucepan and pour over fish. Heat 3 tablespoons of peanut or corn oil in a saucepan over high heat until smoke rises. Add the remaining ginger, a portion of the green scallion and lemongrass (keeping some back for garnish) and heat for 10 to 15 seconds. Pour this hot oil and seasoning mixture over the fish. Place remaining scallion and lemongrass threads on fish for garnish and serve immediately. Do not boil on high heat as this can cause tearing of the fish flesh. Cook fish at a slow, medium boil. You can create a nice garnish with the scallion greens by placing them in a bowl of ice water until the threads curl. Use soy sauce to taste. We actually prefer more soy sauce on our fish, and also like to add Shaoxing wine to our soy sauce mixture. Grace Lin is one of our family's favorite authors. We started out with Round is a Mooncake, graduated to The Seven Chinese Sisters, and for the past year, WeiWei has picked up and re-read The Year of the Dog and The Year of the Rat more times than I can remember. I finally signed WeiWei up for Grace's monthly email newsletter so that she would stop asking ME when Grace was going to release a follow up to her favorite books (like I know). While reading Grace's March newsletter, I discovered that The Ugly Vegetables turns 10 today. I know that there are many families who have enjoyed this award-winning book together over the past decade. If your copy is as worn as ours, you'll be glad to know that the publisher is releasing a special anniversary edition that includes a new cover design and an updated pinyin glossary to make pronouncing the book's vegetables much easier. Even better, Grace has created Ugly Vegetable activities that include a coloring page, a scripted play by FCC-Portland Maine, audio pronunciations of the vegetables, and a lesson plan and recipe for Ugly Vegetable soup. Our Girl Scout troop, which is made up primarily of girls adopted from China, is planning to use Grace's lesson plan as an activity next month. I look forward to sharing how the girls react to bringing this book to life. In the meantime, be sure to check out Grace's website where you can find out more about her first book The Ugly Vegetables, as well as many others that will undoubtedly be enjoyed for generations to come. A number of years ago, when my eldest daughter was in kindergarten, she sat in the backseat of the car while I drove her home from school. In the midst of our chatter about her day, she blurted out "Look Mom, I'm Chinese." I glanced in the rearview mirror to see my Asian daughter grinning like a Cheshire cat while holding her tiny little index fingers against each eye and tugging them upward into an awkward squint. I had to compose myself while responding, "Yes, WeiWei, you ARE Chinese." This was certainly not the first time I had seen this gesture. In fact, it would be fair to say that the first time I saw "Slant Eyes" was when I was in kindergarten. Isn't that when most of us stood around on the playground manipulating our eyes into little slanty squints and chanting "Me Chinese, Me play trick..." At the time, I remember it seeming both hysterically funny and somewhat forbidden. At that young age, you have just begun to realize that there are differences among your peers and you have also come into a treasure trove of hand-me-down "funnies" that span generations ahead of you. I did explain to WeiWei that the slant eyes gesture was in poor taste and she confidently relayed this to the friends who taught her this fun, new trick. And, that was that. Five year olds were educated in the nuances of cultural diversity and they forgot all about their game. I expect this sort of behavior out of five year olds. They have only just begun to explore the world around them and to their credit, when provided the opportunity, quite often they learn, and they gain a sense of compassion. After recently counseling a friend last month that she should let a third grade slant eyes incident go, I found myself confronted with the now infamous Miley Cyrus and friends slant eye photo. Cyrus' most recent faux pas has left me wondering if I had not been taking this issue seriously enough. I have always viewed the problem as one of a lack of cultural awareness that could be overcome with some basic education. It is painfully obvious that at the advanced age of 16, someone had missed having this conversation with Cyrus. What really caused me to catch my breath, however, was the web poll put out by Disney and Cyrus. They actually felt compelled to create a poll to justify her actions. Not surprisingly, a majority of the little girls who visit her website thought that Cyrus was "just having fun and being goofy." These are the same little girls who are making Chinese eyes at my children on the playground -- of course THEY think it's just hilarious. What this says to me is that Miley Cyrus is now plotting her moral compass based upon the accepted behaviors of nine year olds. When I asked WeiWei, who is now 10, if the Cyrus photo bothered her, she said "No, I'm used to it." We have worked hard to make sure that our girls are strong and able to handle themselves in moments of cultural insensitivity. And, I have personally seen them do very well in these awkward situations. As a parent who wants nothing more than to protect her children from hurtful remarks, this resilience doesn't make WeiWei's response any easier to take. From responses that I have read, it would seem that I am being overly sensitive to the matter. However, there are a lot of parents who agree that Cyrus' behavior merits both concern and action, including Deborah Levine, a Board member from New York's Families With Children from China. While I still believe that this is ultimately an issue of education, I will be less inclined to brush it off so readily in the future. It is never acceptable to be "goofy" at the expense of others, no matter what a bunch of nine years olds tell you is OK.
Lydia Miyashita captivated the Chinese adoptive community for the past six months. Tragically, the five year old from Ohio lost her battle with a rare form of leukemia last Tuesday. Her mother, Monica chronicled the family’s hope and the heartbreak in their Caring Bridge blog, which has been followed religiously by tens of thousands of adoptive families. Lydia's transplant doctor, Dr. Xiaxin Lin played an incredible matchmaker in her story by helping to locate her biological birth family, which included a 16-year old sister, who was a bone marrow match. Unfortunately, Lydia was never able to stabilize so that she could be brought into remission for a bone marrow transplant. She died in the arms of a family who loved her deeply, and will remain in the hearts of many who never personally knew her but held her close in their hearts, nonetheless. Lydia's arrival in the news around November 2008 reminded many of us of another similar pursuit that began in 2002. Kailee Wells was also five years old when she was stricken with Severe Aplastic Anemia. Her parents began a worldwide search for a bone marrow match and were fortunate enough to find one in a Chinese citizen by the name of Wang Lin. Wang stepped forward after being inspired by Linda and Owen Wells' tireless efforts to not only find a bone marrow match for Kailee, but to increase the number of Asians who are listed in the bone marrow registry. While Kailee still struggles with her illness, Wang's selfless give has given her a new lease on life. Every day, there are more than 6,000 people searching the National Marrow Donor Registry looking for a matching marrow donor. Leukemia, lymphoma and many other life-threatening diseases can be treated by a bone marrow or cord blood transplant. As seen in the stories of Lydia and Kailee, race and ethnicity play a major roll in the matching of both marrow and tissue. While family members most often are the closest match, there remains the possibility of finding a match outside of the biological hemisphere. The number of Asians in the bone marrow registry is still very low. Increasing the number of registered bone marrow and cord blood donors, can save lives. Visit the National Marrow Donor Program site to register as a donor or visit the Asian American Donor program to learn more about the specific need for Asian donors. There is nothing that can be done to ease the Miyashita's loss, but we can help prevent this tragedy for another family. Like many of ChinaSprout's customers, I have children adopted from China. My daughters are both from the Zhuzhou Social Welfare Institute in the Hunan province. Just over a year ago, our family moved from Los Angeles to the Midwest. It wasn't until we moved that I realized how easy we had it in Los Angeles when it came to teaching the girls about their cultural heritage. We had many Chinese friends; there was a large and accessible Chinese community; we regularly took the train to Chinatown for dim sum; we attended the Chinese New Year parade every year; and the girls had a group of friends who enjoyed sharing their own cultures, so they gained a respect for cultural diversity and pride in their own heritage. We are blessed with an active and dedicated Families with Children From China (FCC) group in our new home state. There is also a notable and growing Chinese community, which has made great strides at creating wonderful cultural opportunities. However, it is still a much greater challenge to expose the girls to the Chinese culture in the Midwest. Many Chinese adoptive families and FCC organizations are struggling with the same question -- how do we keep our children's interest in their Chinese heritage alive, particularly as they mature? There seemed no better place than ChinaSprout to pose these tough questions, discuss issues of importance, and share fun activities that we undertake in an effort to engage our children in learning about their cultural heritage. These topics are in no way limited to adoptive families, as I expect that the issues that we face will speak to any family of Chinese decent. I hope that you will join in the dialogue and share your experiences so that we can learn from each other.